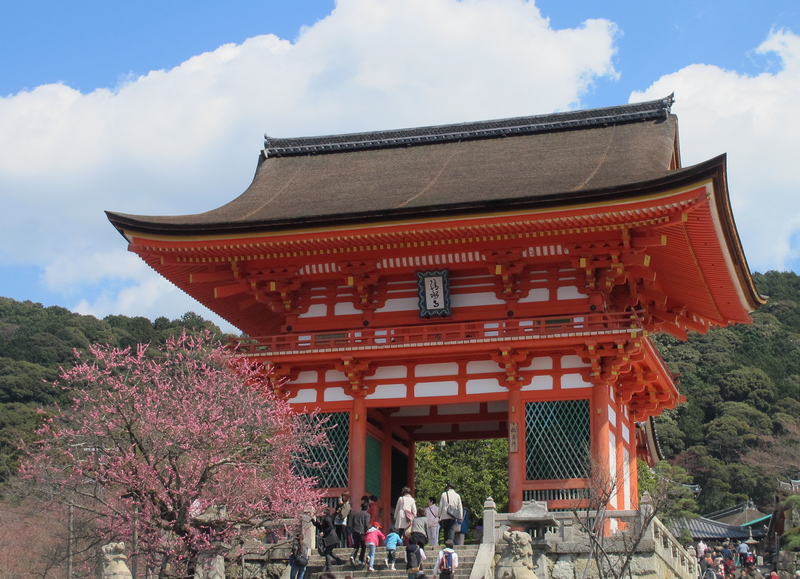 Whilst planning our itinerary for Kyoto, and living in Beijing, my friend Jenny had mentioned to me a couple of places we had to visit; one being the Gion District to see the Geisha and the other being Pontocho which is an old entertainment district with traditional restaurants, bars and a few of the city’s elusive Geisha tea houses. I couldn’t wait!! On our very first evening in Kyoto we walked to Pontocho from our hotel and on the way we walked past Kamogawa River which had restaurants and bars on its banks. 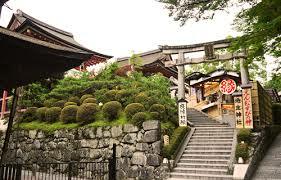 When we arrived at Pontocho we saw it was centred around a narrow alley with beautiful walkways. I immediately fell in love with this beautiful alley. It’s a lovely place for a stroll, particularly in the early evening as when darkness is about to set in, lovely street lamps/lanterns are lit. 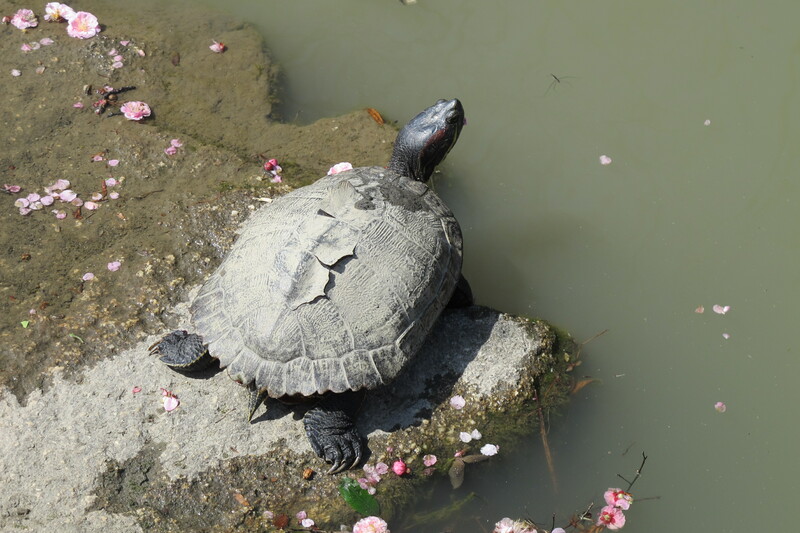 My research showed that Pontocho is a place where you might see Geisha rushing off to a tea house or performance – we didn’t see any unfortunately (but did in Gion and more on that in another post). We decided to try and find a place to eat as we had read that Pontocho has many fine eateries featuring mostly Kyoto cuisine. Of course all signs and menus are in Japanese and as my friend and I did not speak nor could we read Japanese, we had to go by the look of the place. 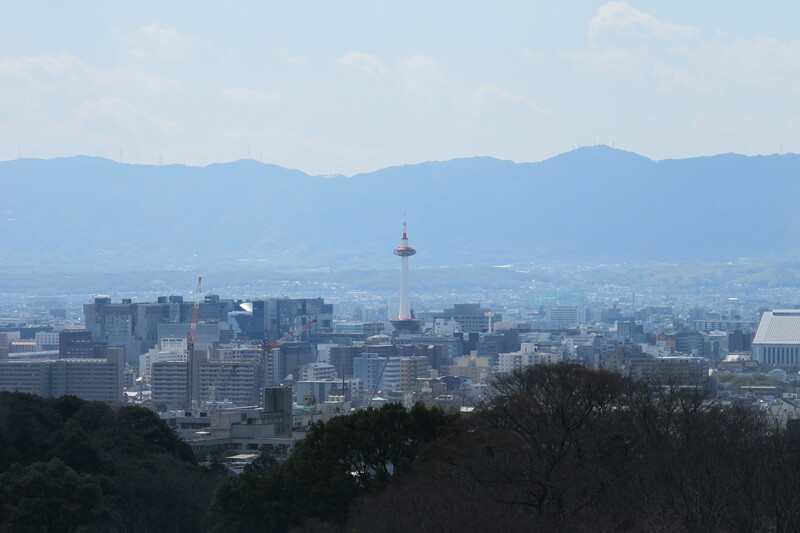 I knew that many of the restaurants in Pontocho require formal attire in the evenings and considering we were in jeans, we looked for somewhere that appeared to be more casual – we found a pub like place up some stairs and enjoyed a wonderful meal with wine and a lovely view. The owner was such a lovely man and the menu had a little English but we worked it out and I was served a wonderful vegetarian meal. We had read that the area is known for its high prices and exclusive establishments that only accept reservations from people they know or know by reputation. Other businesses in Pontocho aren’t particularly exclusive but require reservations by phone in Japanese. So I think we were very fortunate to find this wonderful restaurant where we were the only two diners during the hour or so we were there. Pontocho is definitely a place worth visiting especially at dusk. 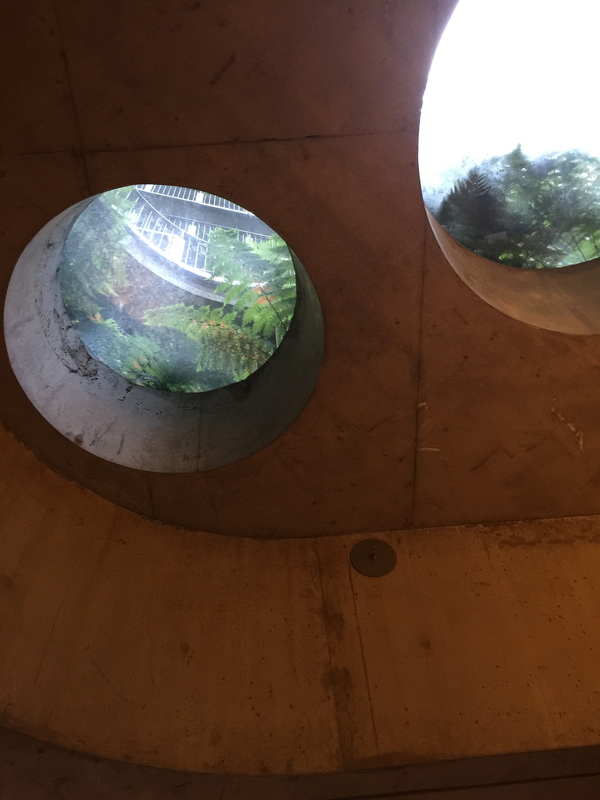 Make sure you look down at the pathway – beautiful designs embedded into the stones. 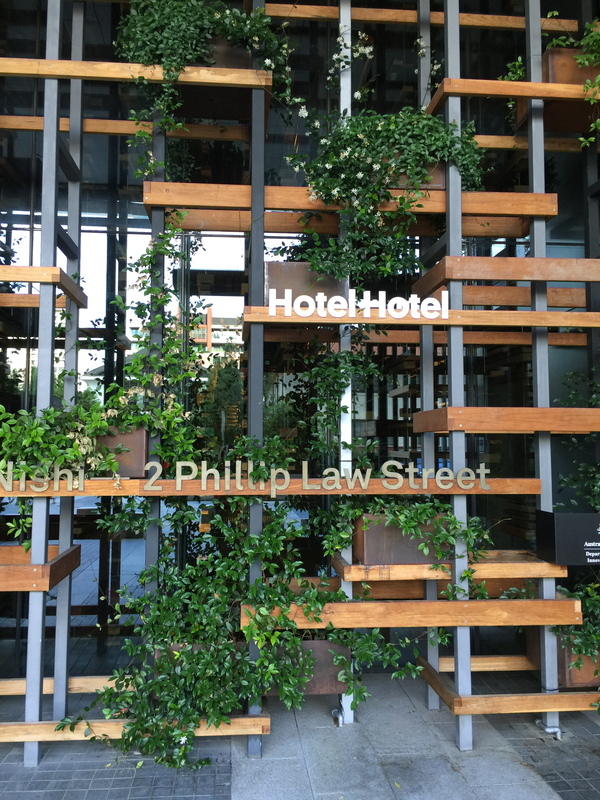 Monster kitchen and bar is located on the ground floor of Hotel Hotel, a relatively new hotel in Canberra. 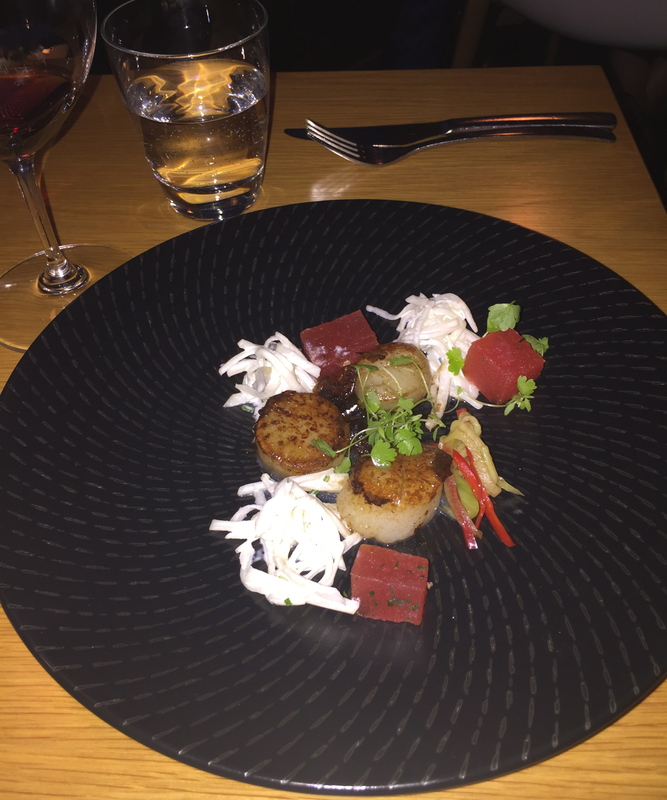 The restaurant sources local and seasonal produce and like many restaurants in Canberra now, the meals are prepared for sharing which gives you the opportunity to taste lots on the menu. It was a little bit strange as the restaurant is actually located in the foyer area of the hotel, with the kitchen overlooking the diners (it is the fact it’s in the foyer that is the unusual part). The public spaces in the hotel include a library stocked with current and vintage books and two fabulous large fireplaces. As its website says, the hotel is a place of collaborative craftsmanship conceived of and made by artists, makers, designers and fantasists. 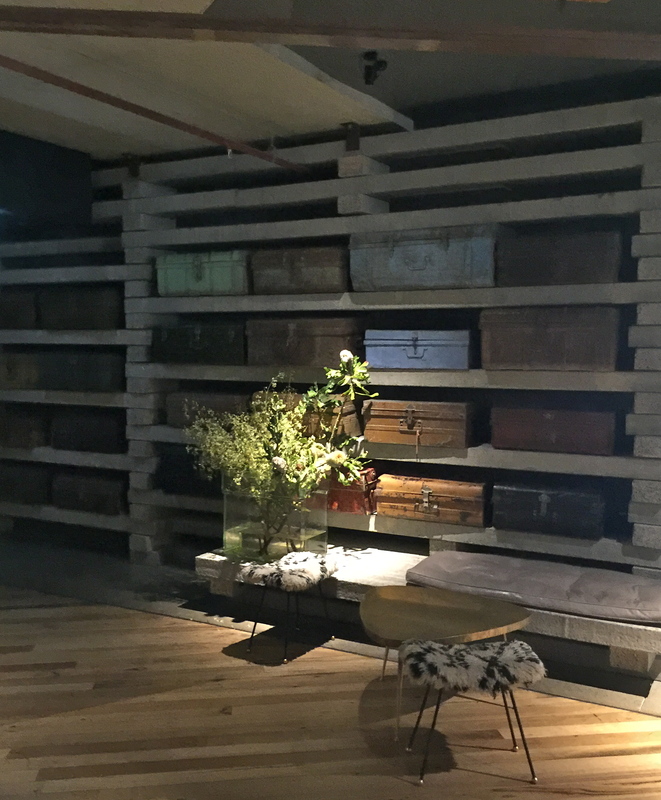 The sixty-eight rooms are dressed with salvaged and restored 20th century Australian furniture, original artworks, collected objects, and artisan made furnishings. 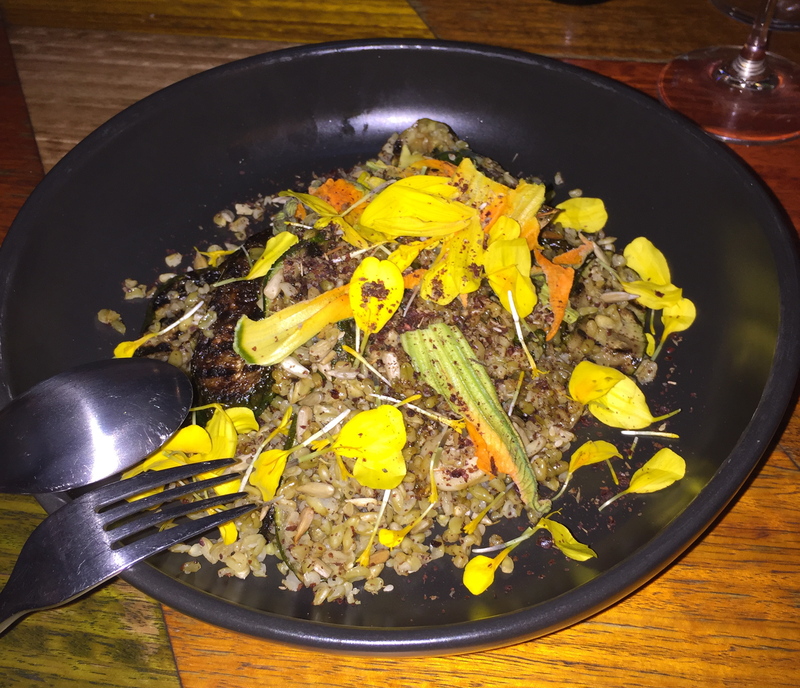 So, onto our food, I ordered three vegetarian dishes to share; eggplant, smoked goats curd and sesame oil (the eggplant was delicious and my friends ate the goats curd), the hand cut chips and house made ketchup (chips were a bit cold and limp unfortunately) and the zucchini, freekeh (which I found out was roasted wheat), nasturtium and sunflower – this was also quite tasty. My meat eating friends ordered the liquorice cured duck breast, witlof with cherry and sorrel, the wagu rump with salsa verde, onion and mustard and the steamed Daintree barramundi with miso, pickles and candied nori. 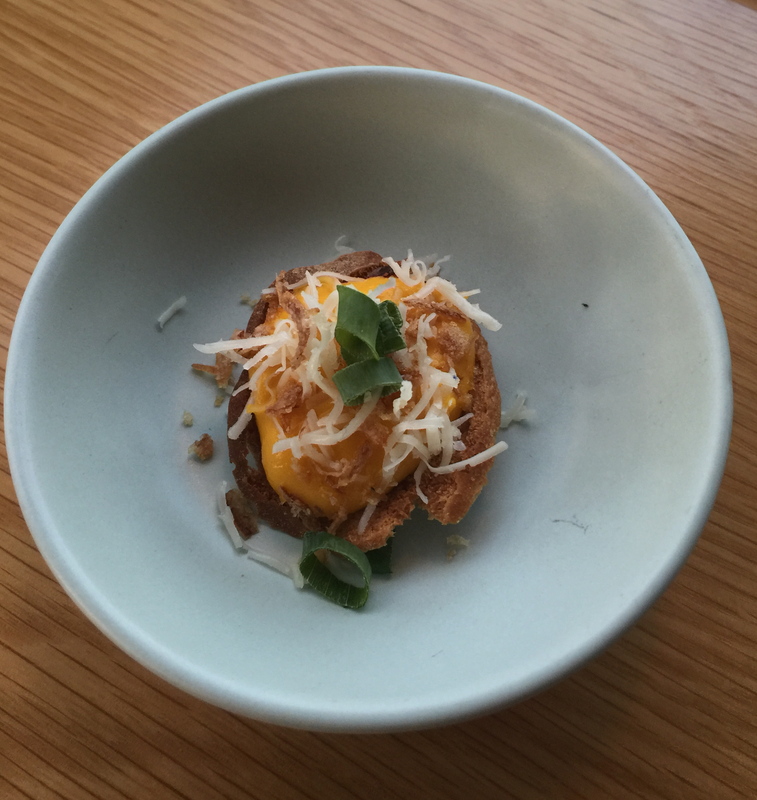 My three friends said each dish was delicious. 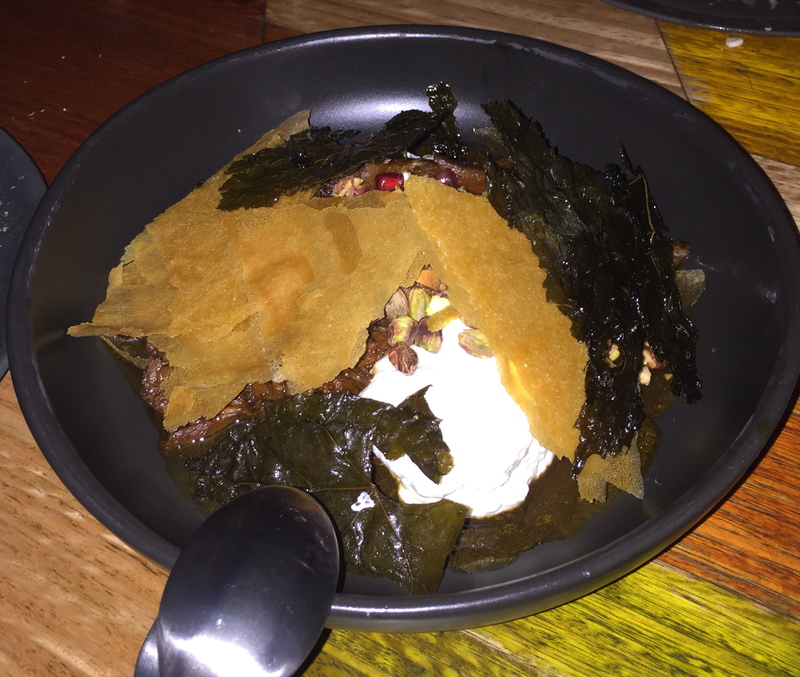 I enjoyed the evening with my friends and the food was very nice, so filling that none of us ordered any dessert. 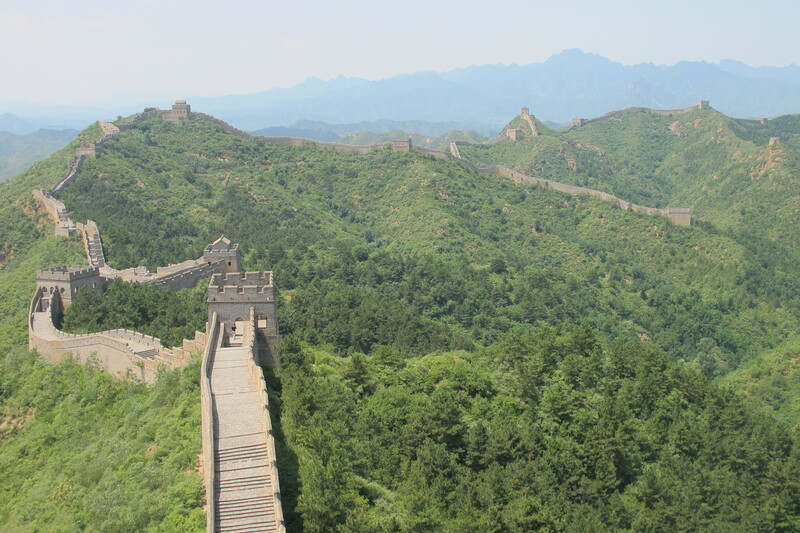 During my time working in Beijing, I went to see and walked on the Great Wall many times, and was fortunate to travel to many different parts including Badaling, Huanghua, Laolongtou, Mutianyu, Xing Long Xia, Jinshanling (which this post relates to), Jiayu Pass and Simatai. Some of these are more commercial than others and some are parts of the wall that are not in the original state. 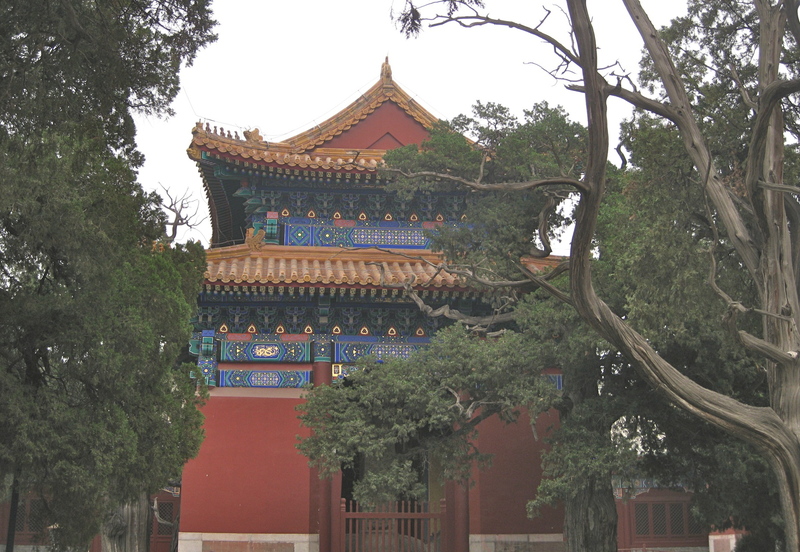 The initial section of Jinshanling has been restored to original condition, but the condition of the wall deteriorates towards its natural state as it approaches Simatai. I took two different visitors to this part of the wall and both could not believe how amazing it was, firstly to only have about twenty other people on the wall (including one young Chinese girl in very high heels) and loved seeing the un-restored part of the wall. 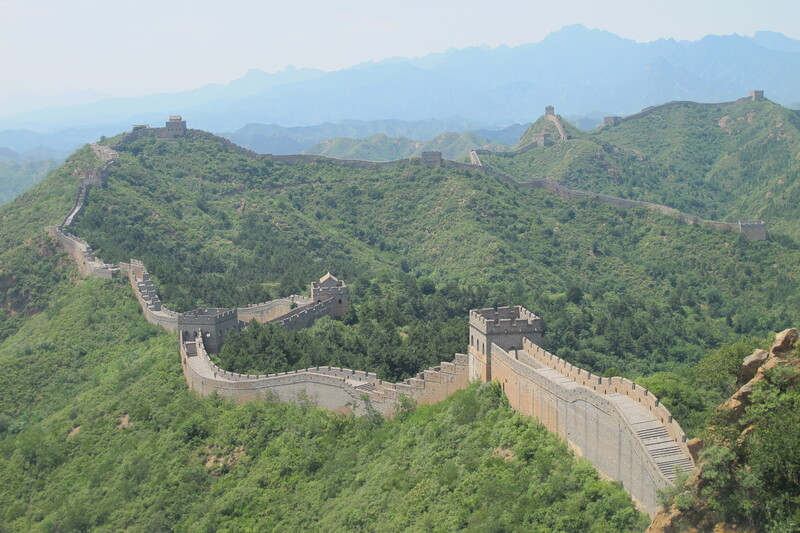 This particular part of the Great Wall is located on the Jinshanling Mountains in Chengde, Hebei Province which is about 130 kilometres northeast of Beijing. 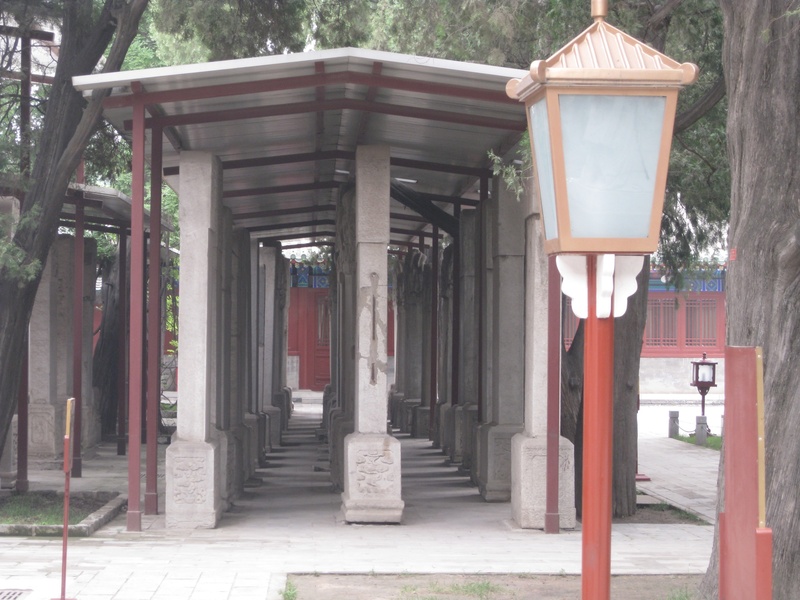 This section of the wall is connected with the Simatai section to the east and the Mutianyu section to the west. 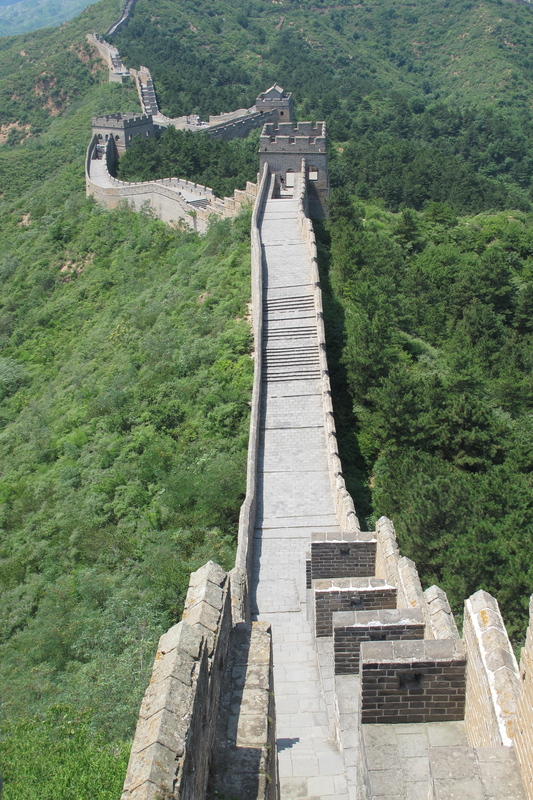 This part of the Wall was constructed during the Ming Dynasty and has a total length of 10.5 kilometres and is 700 metres above sea level. I really loved this part of the wall. It was fun to take the cable car to the top of the mountain and then walk along the wall (some parts a bit scary as the wall did not have any sides), but to reach the un-restored part and know that it was built so many (many) years ago was amazing. 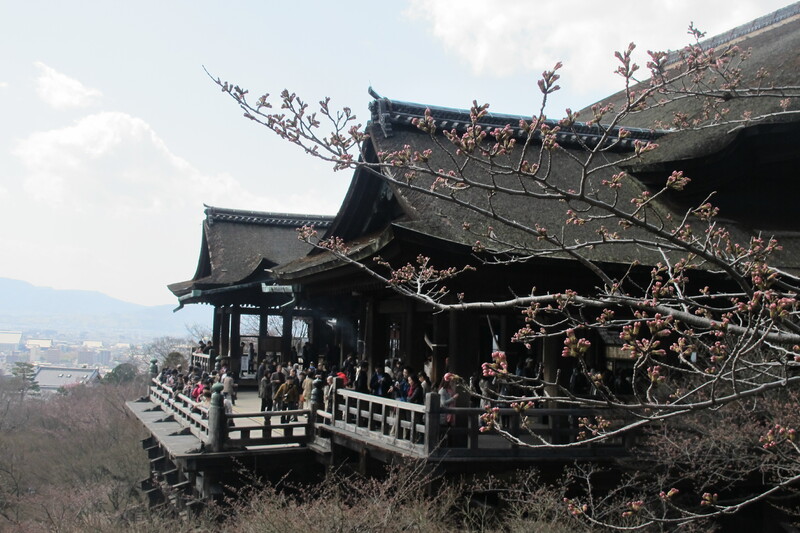 Kiyomizu-dera which literally means ‘Pure Water Temple’ is one of the most celebrated temples in Japan. 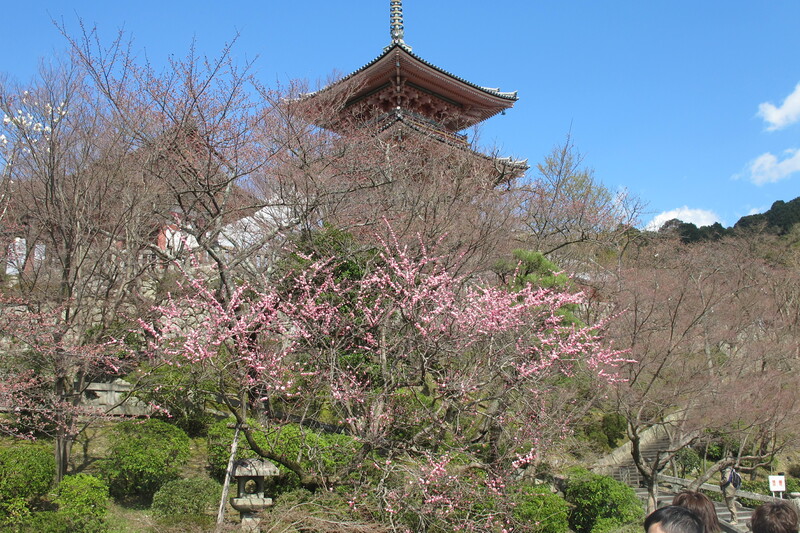 It was founded in 780 on the site of the Otowa Waterfall in the hills east of Kyoto, and derives its name from the fall’s pure waters. 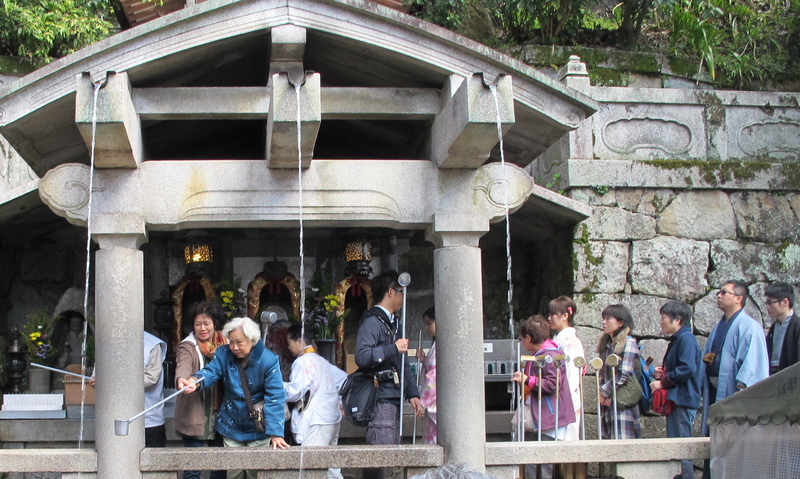 The temple is located half way up Otowa Mountain and people come from all over Japan and elsewhere to visit the waterfall and drink the sacred water from a ladle. 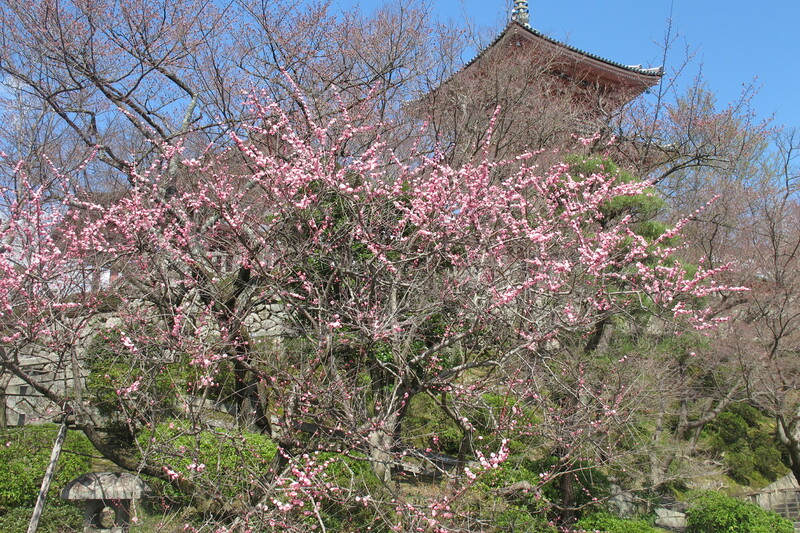 The temple was originally associated with the Hosso sect, one of the oldest schools of Japanese Buddhism, but formed its own Kita Hosso sect in 1965 (source http://www.japan-guide.com). 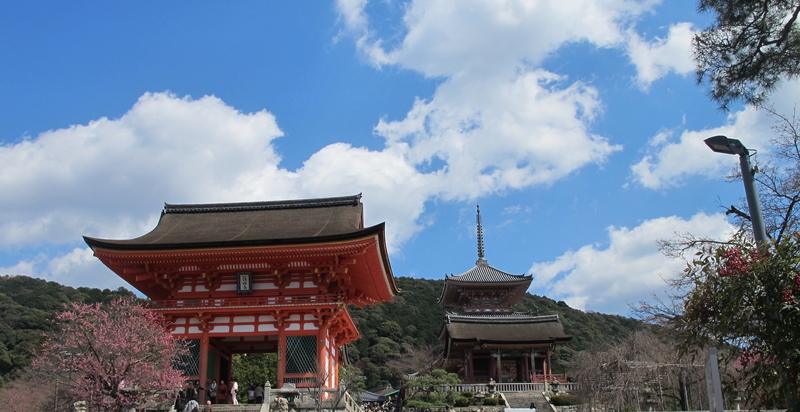 I visited this temple and surrounding grounds during my visit to Kyoto in 2012. 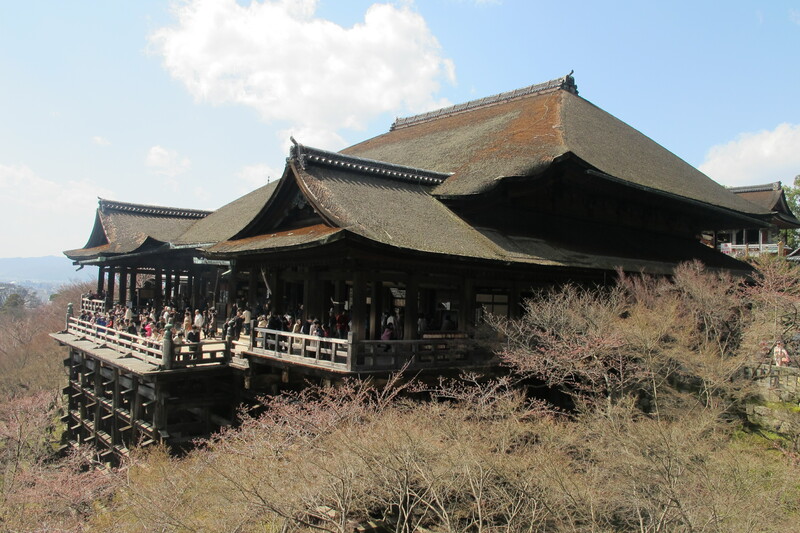 The temple is renowned for its wooden stage that juts out from its main hall, thirteen meters above the hillside below. It gets incredibly busy on this wooden stage; I expected this really, as it’s what the temple is known for – felt a bit like everywhere in China. 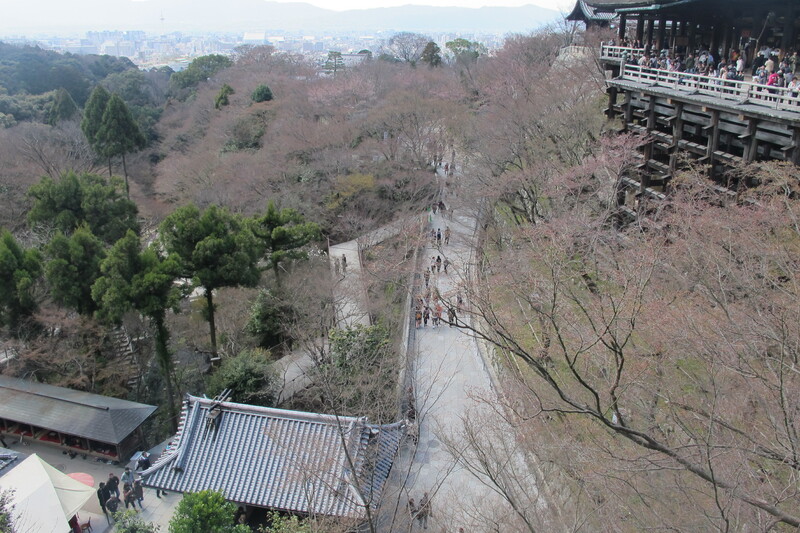 The stage affords a lovely view of the cherry and maple trees below, as well as the city of Kyoto in the distance. 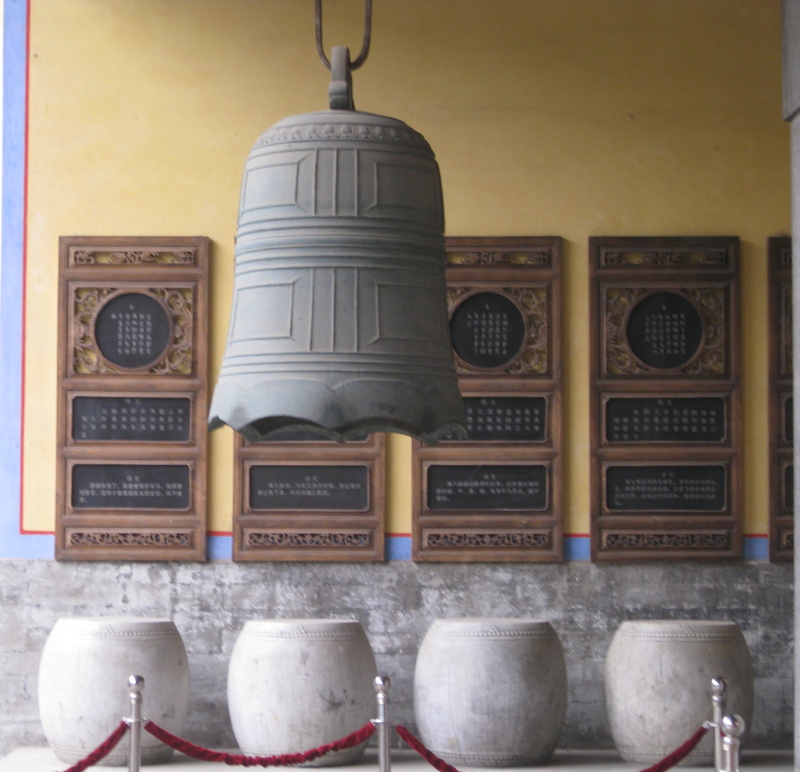 The main hall, which together with the stage was built without the use of nails and houses the temple’s primary object of worship, a small statue comprising eleven faces and a thousand arms. 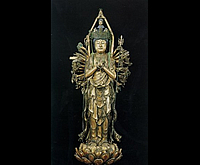 This statue is said to have the power to answer prayers. 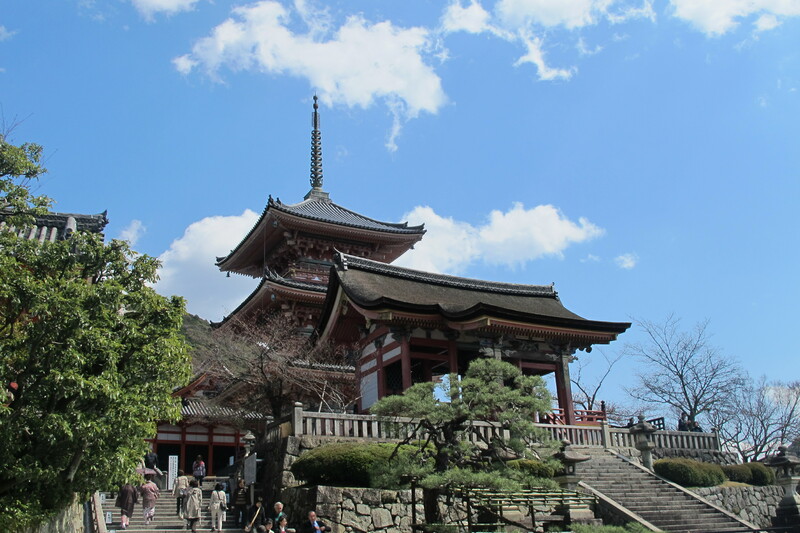 Behind the temple’s main hall stands the Jishu Shrine which is dedicated to the god or goddess of love and matchmaking. 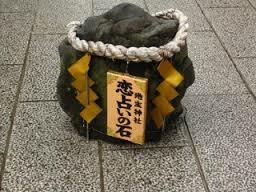 In front of the shrine are two stones, placed eighteen meters apart. It is said that if you are successful in finding your way from one to the other with your eyes closed you will find love. 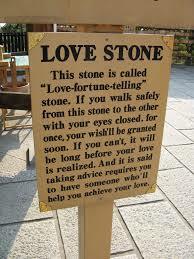 One interesting point I learnt whilst at the shrine was that you can have someone guide you from one stone to the other, but that is interpreted to mean that an intermediary will be needed in your love life as well. Amusing!! 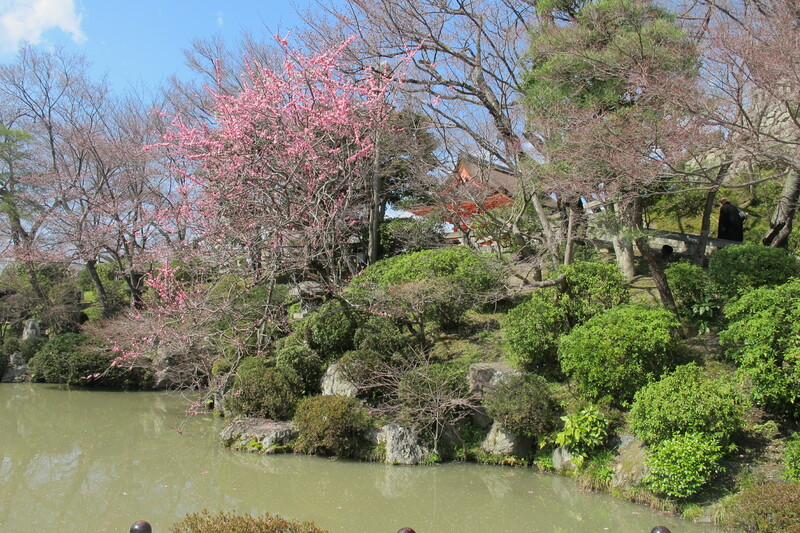 There are lovely grounds surrounding the temple and beautiful small ponds and lakes; all worth seeing when you are strolling around. 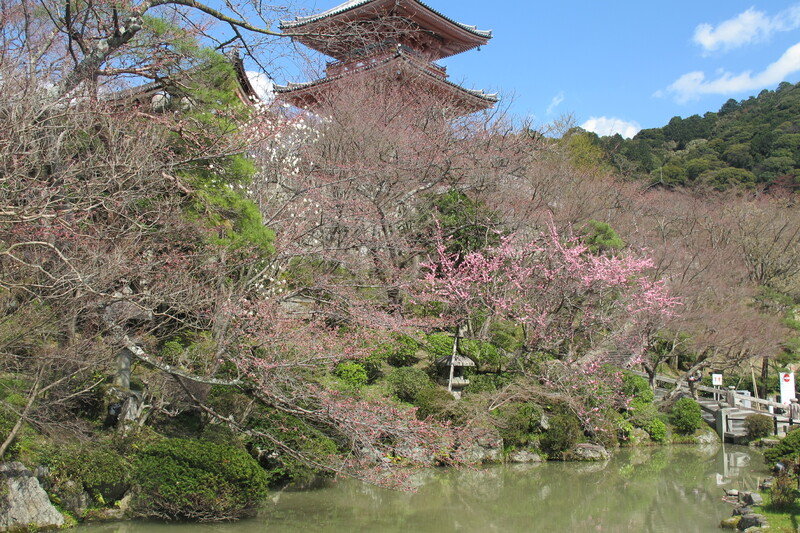 Another wonderful site in gorgeous Kyoto. 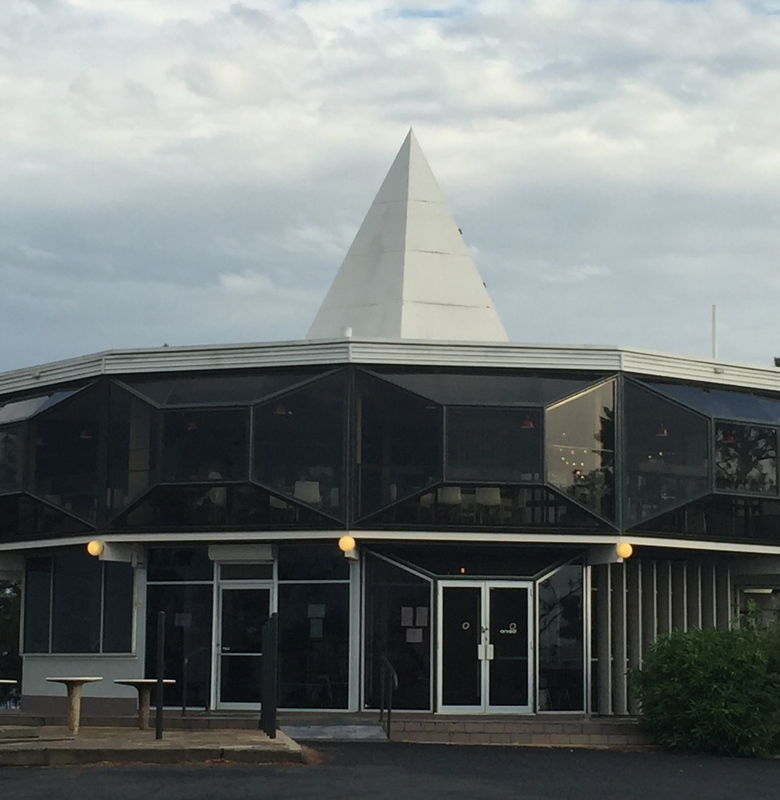 This is another restaurant in Canberra that I have wanted to try – it came with good recommendations from diners on the net and from some of my friends. 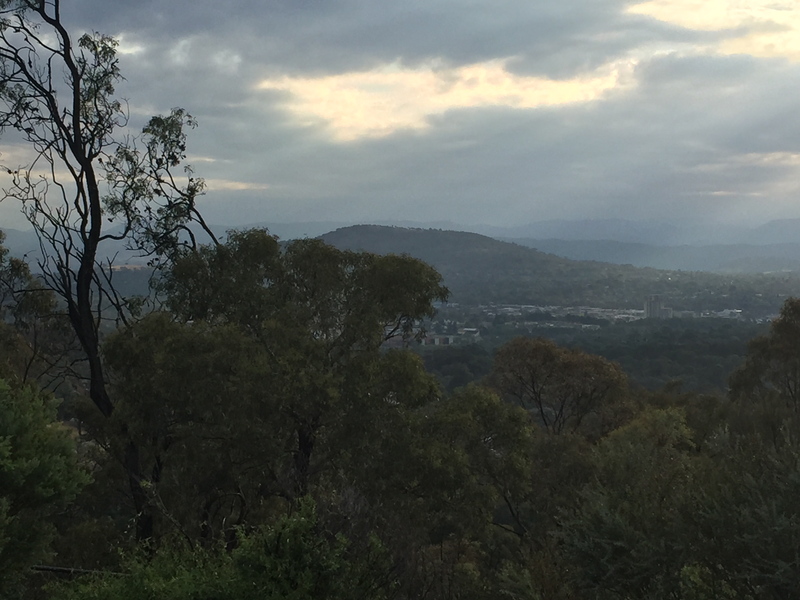 The restaurant is located on the top of Red Hill, one of the ‘mountains’ in Canberra with a menu that is for ‘tasting’ with entrée size meals so that you can order a few and enjoy tasting a lot of the dishes on the menu. 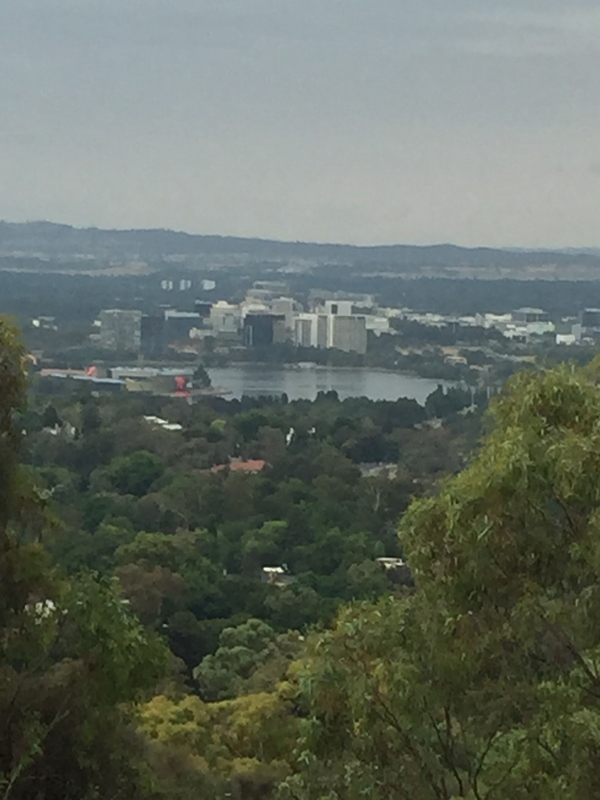 I arrived early so was able to take some photos of Canberra; the city and the bush from the top of Red Hill. I now look at them and they look like they were taken in the 1970’s with a bad camera (but I did only take these with my iPhone so they are not so great). This dinner was with two friends (Karen and Renee) and for the past six months or so, we have been going out to dinner or lunch trying out new restaurants around Canberra. 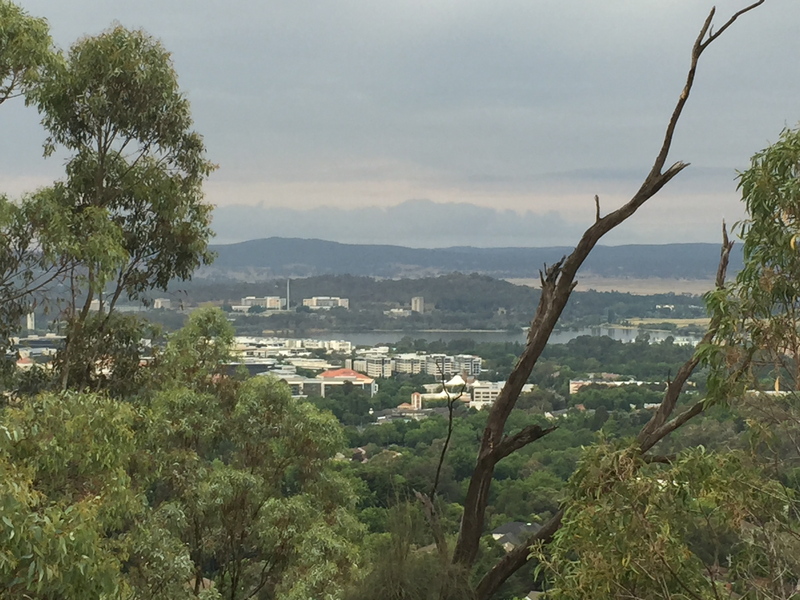 It’s been really nice for the three of us to catch up and we also get to try lots of new and different places in Canberra with some mixed results. This was one such restaurant where we had heard great things about and actually didn’t ‘love’ the food. I had rung the restaurant weeks before to make a reservation as I wanted to book dinner early for 6.00pm. 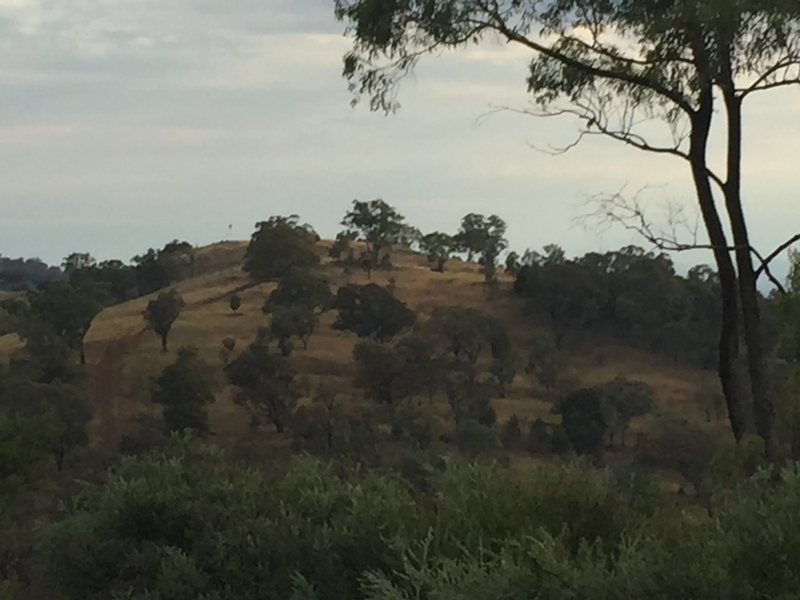 I was told they were hosting a christmas lunch party which would run until around 5pm in the afternoon so they could only accommodate dinner at 7.15pm as they needed to clean up after the party and prepare for dinner. So a bit late for us (me really) on a work night but I agreed. Well when I got there at 7pm, the party was still going with lots of noise; very loud unfortunately. And you know what it’s like when you are somewhere and not drinking and others have been drinking for six hours…nothing is funny to you; loud people laughing like hyenas are not funny to sober people!!! Anyway my friends arrived a little later and we exchanged birthday presents for my friend Karen and started off with a glass of wine, which was really nice. Service was great also throughout the night. 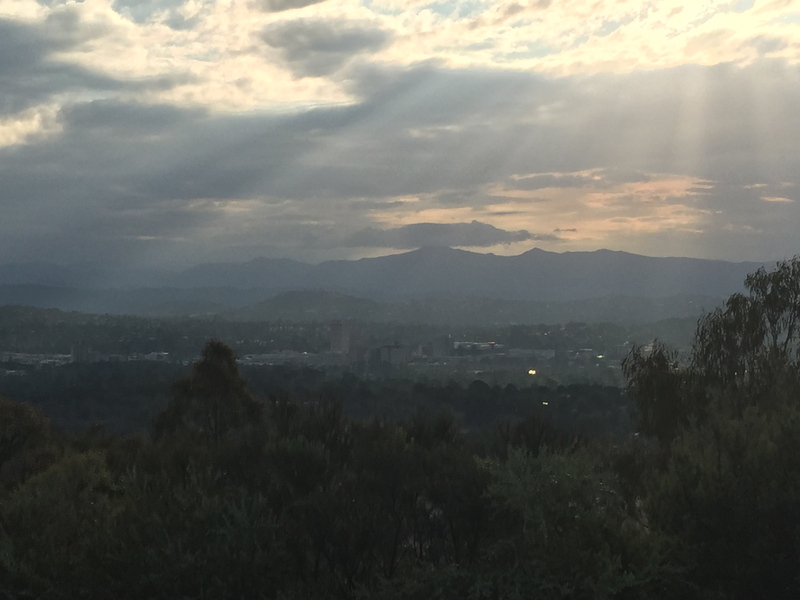 The views from the restaurant are lovely and it was nice to see the sun setting over the mountains. We ordered from the tasting menu and my friends ordered three meat/seafood dishes and I ordered three vegetarian dishes. 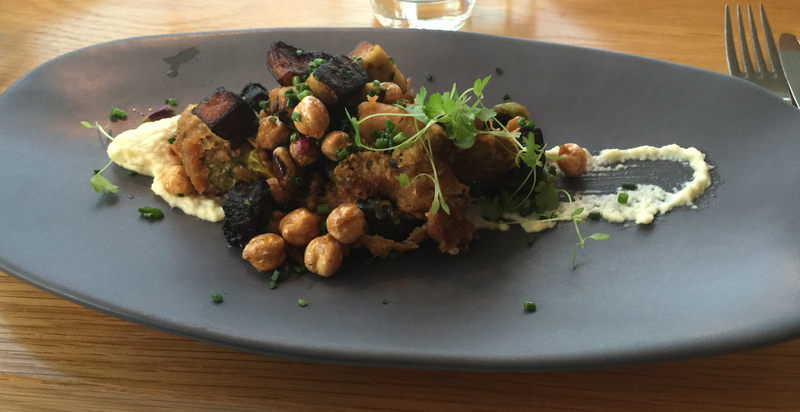 My dishes were the eggplant and chickpea pistachio with tzatziki which I found a little boring, not much taste but looked good. 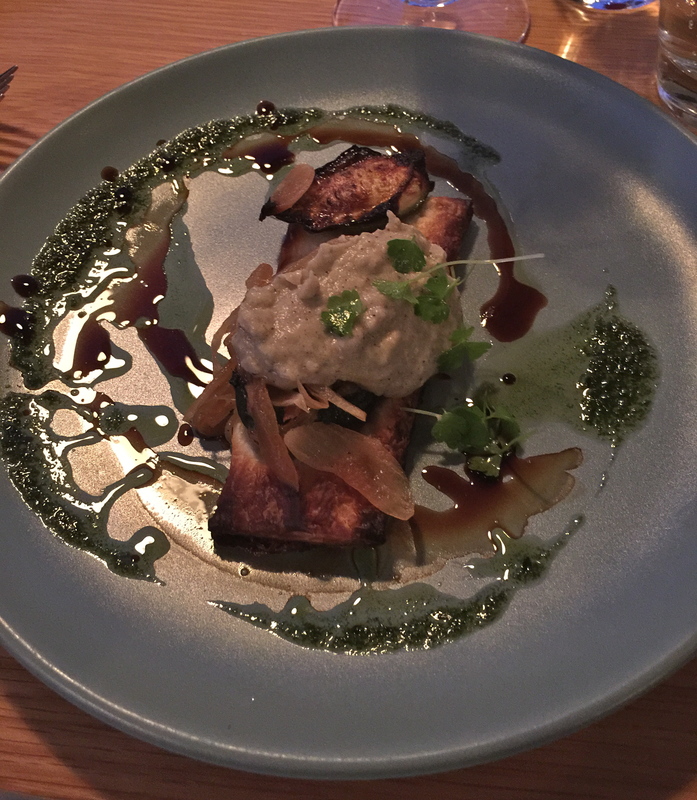 My next dish was the zucchini and caramelised onion tart with baba ghanoush (again not seasoned enough I found). 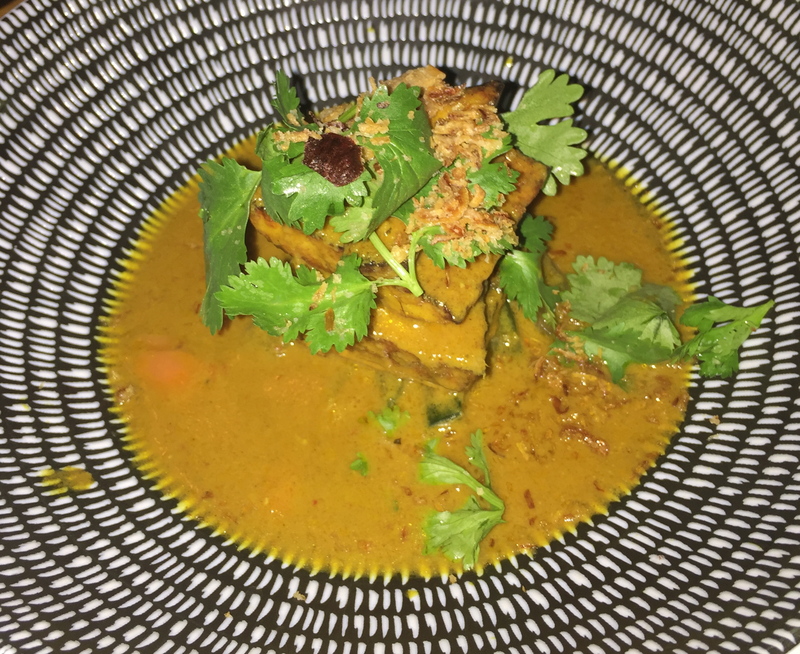 And my final dish was the tofu with laksa and pickled vegetables…now this was really good, the curry was not too spicy and the vegetables were cooked really well. Delicious!! 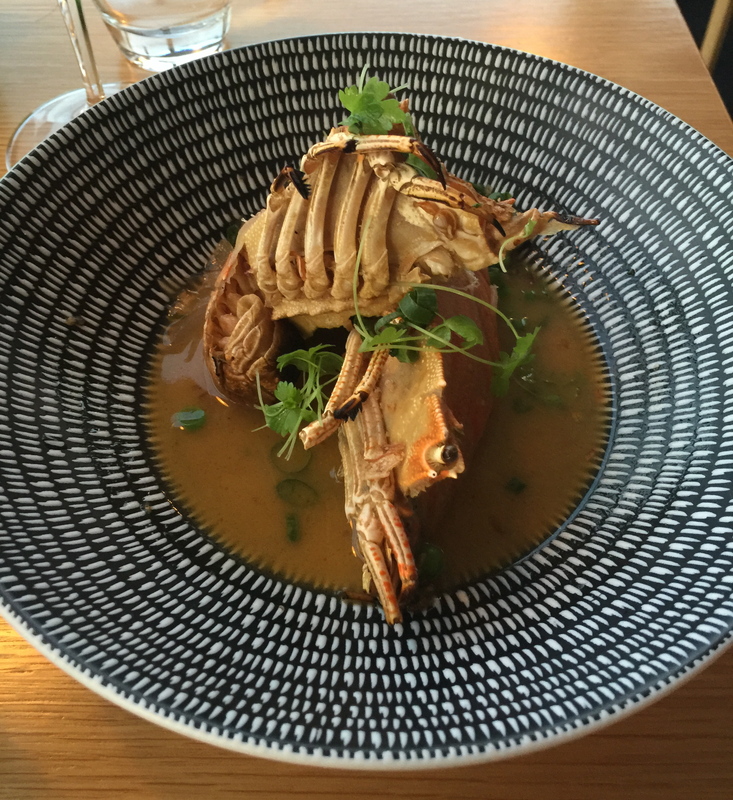 My friends ordered a range of dishes including the moreton bay bug, crustacean bisque and green pea then the blue eyed cod with salad and chilli jam. And it’s funny they said the same thing as me that the dishes whilst looking good, were a little bland. 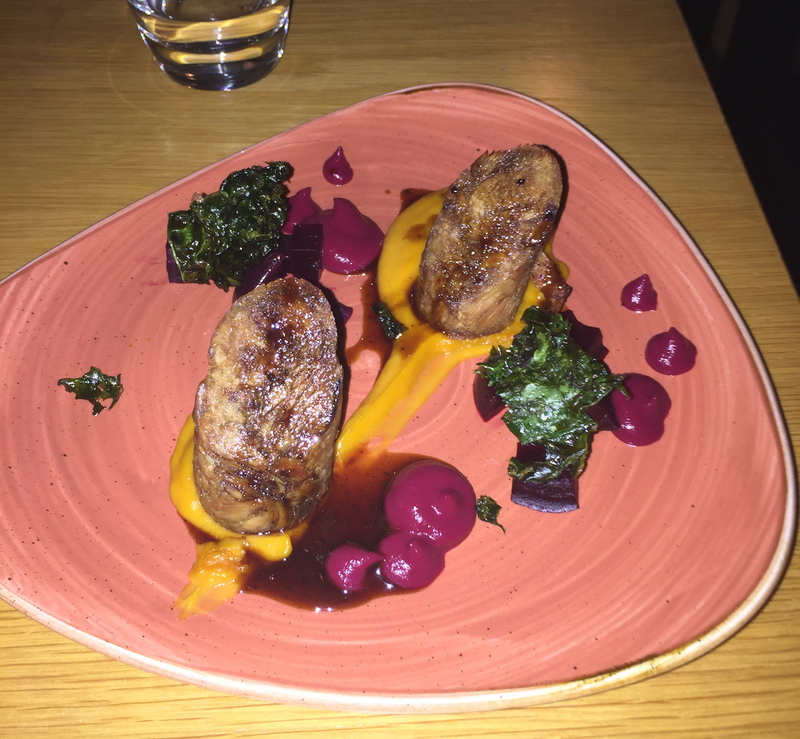 My friends then had the seared scallops with watermelon, bonito, cucumber and dash (I still have no idea what dashi is and neither did my friends) and the shredded confit duck leg with beetroot, sweet potato and kale. 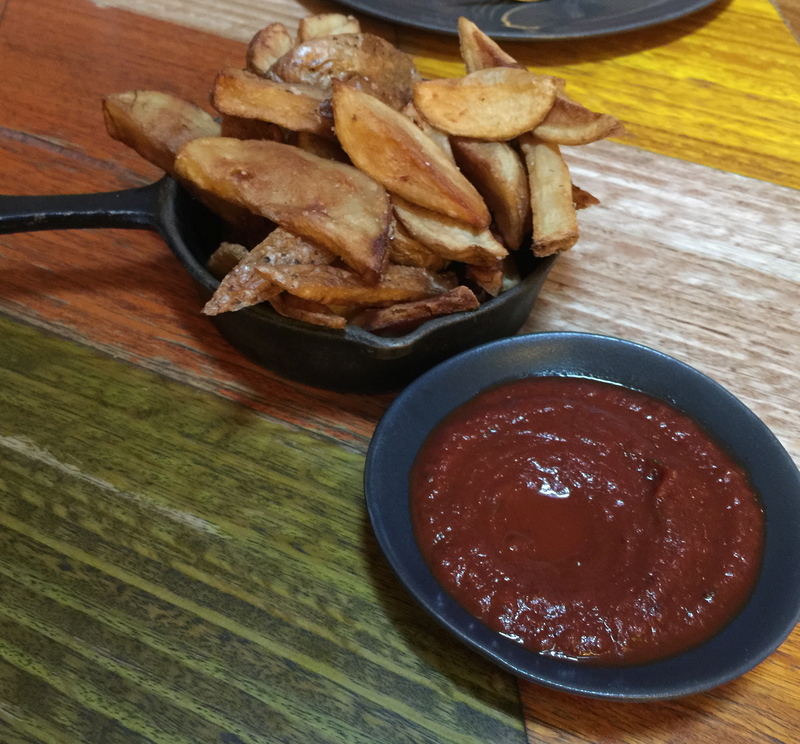 Again both said these dishes were ‘ok’ but a little bit bland; needing more seasoning or something. But we all said that our desserts were the best meal of the evening..we all ordered something different and each said ours was the best!! 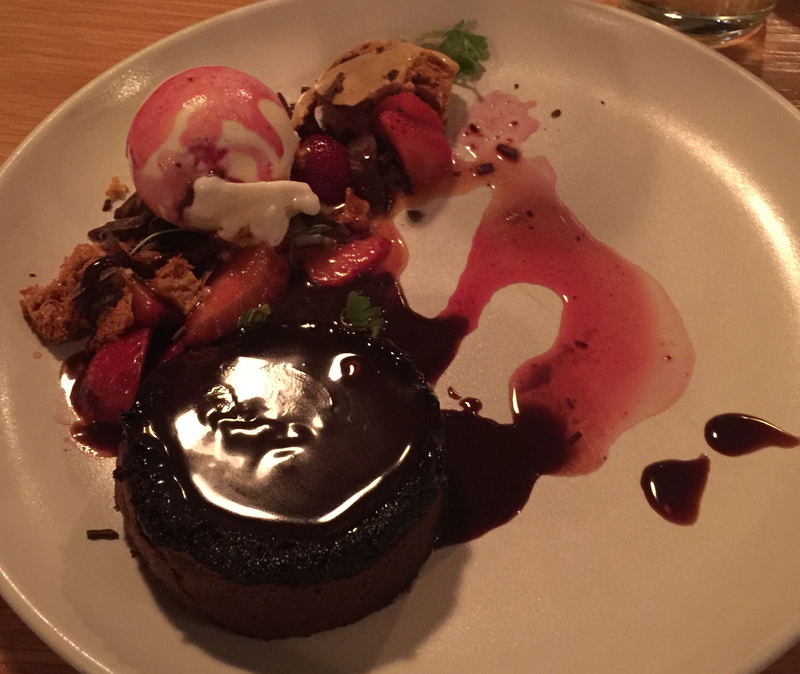 I had the warm chocolate tart with berries and honeycomb (too much to eat so I shared with Renee – who was very happy to have one and a half desserts). 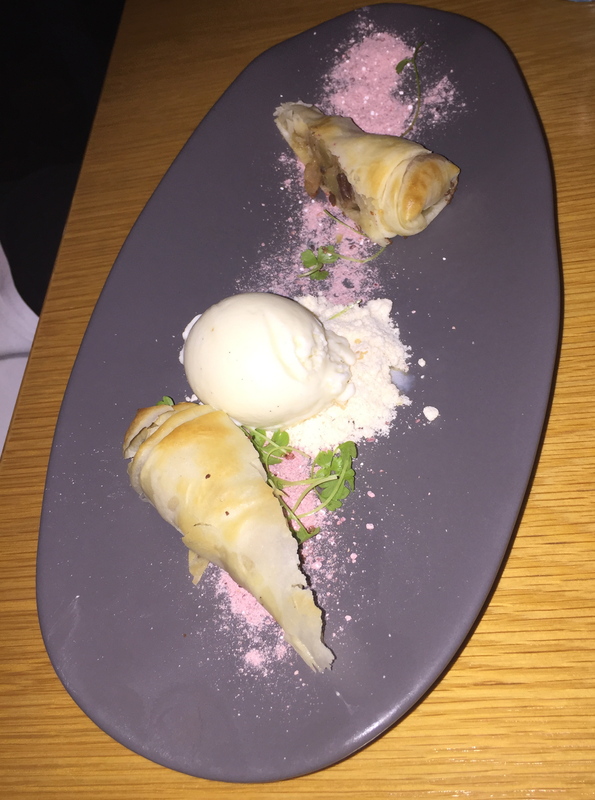 Karen ordered the strudel of apple and drunken sultana with honey and rose (really nice display on the plate and Karen said it was delicious). 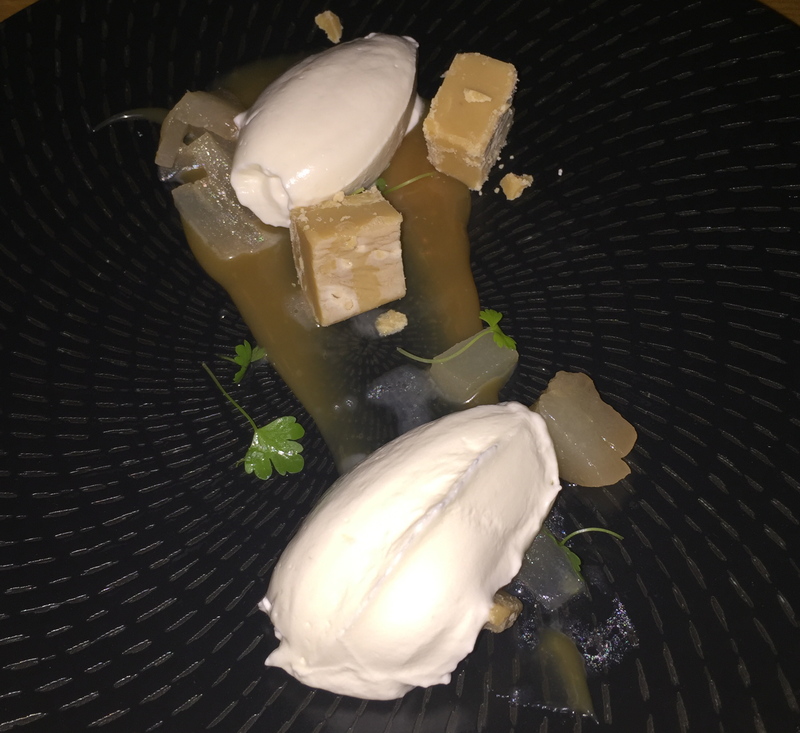 And finally my other friend Renee had the white chocolate marquise with salted caramel and fudge..again was nice and looked fabulous but she said my chocolate dessert was the best. The three of us were glad we went as the views were lovely from the restaurant and service was good but it was much too noisy and food, whilst looked great when served, was, this evening, a little bland. 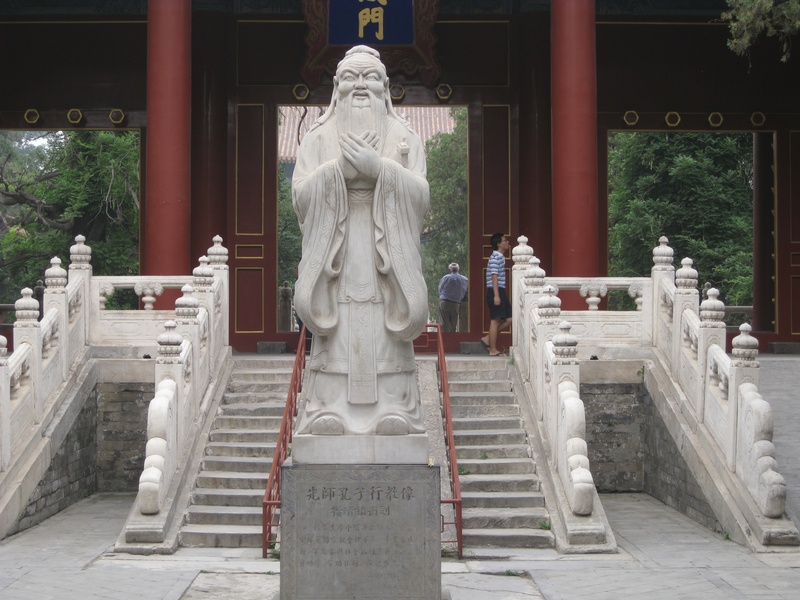 Confucius Temple and Imperial College in Beijing!! 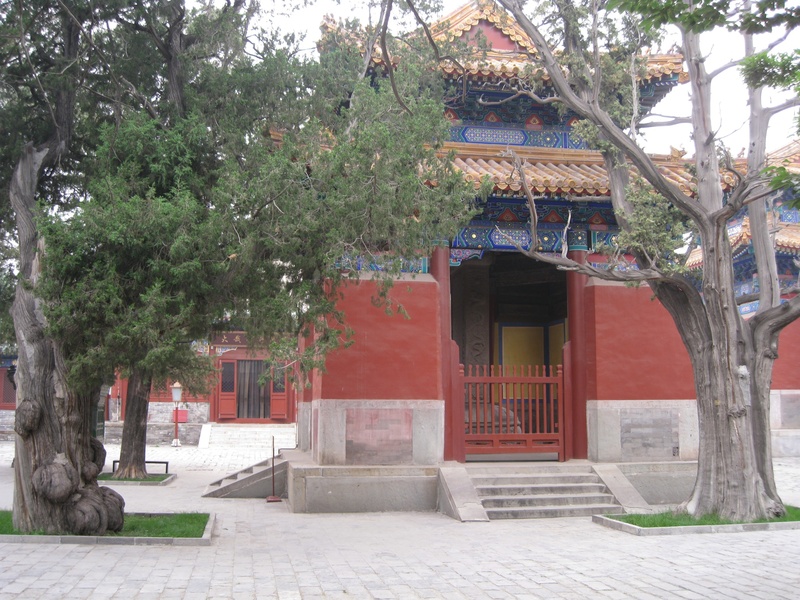 A five minute walk away from Beijing’s Lama Temple is China’s second-largest Confucian temple. 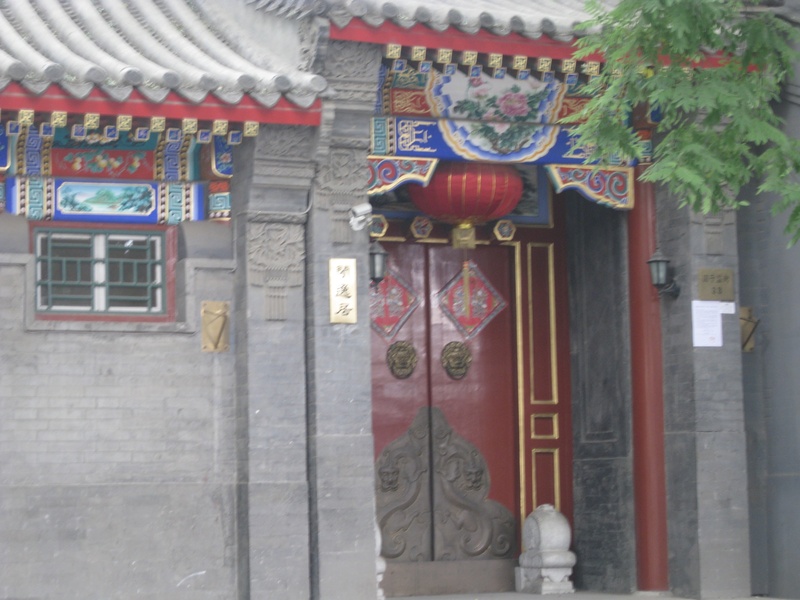 It’s located on a very quiet street which has the usual lovely Chinese entrance doors along the way. 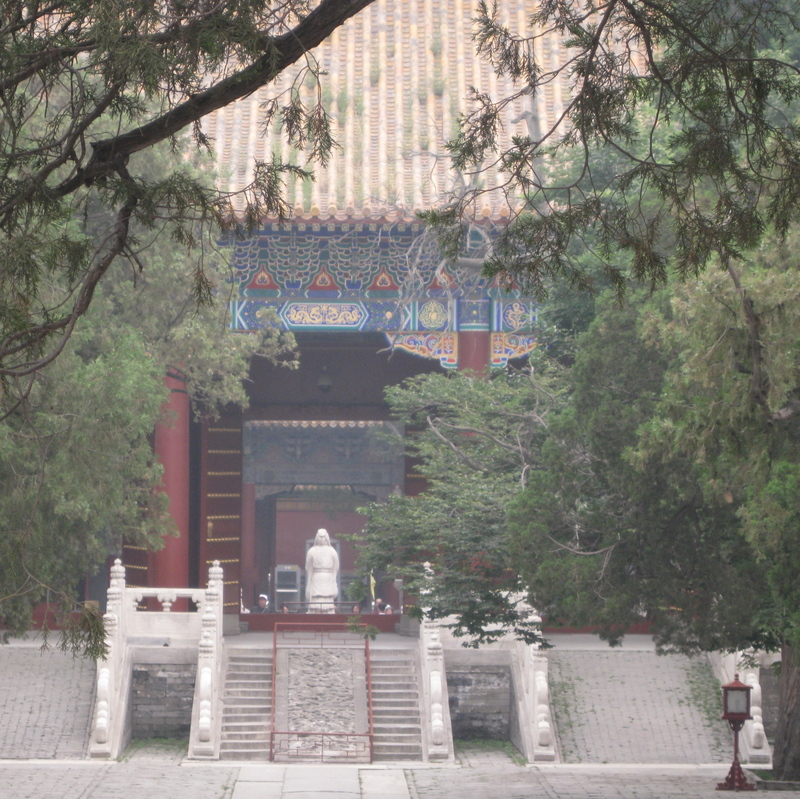 The temple really is a haven of peace and quiet and I was very fortunate that there were not many visitors so I was able to take the majority of my photographs without people in them (something unusual for Beijing). 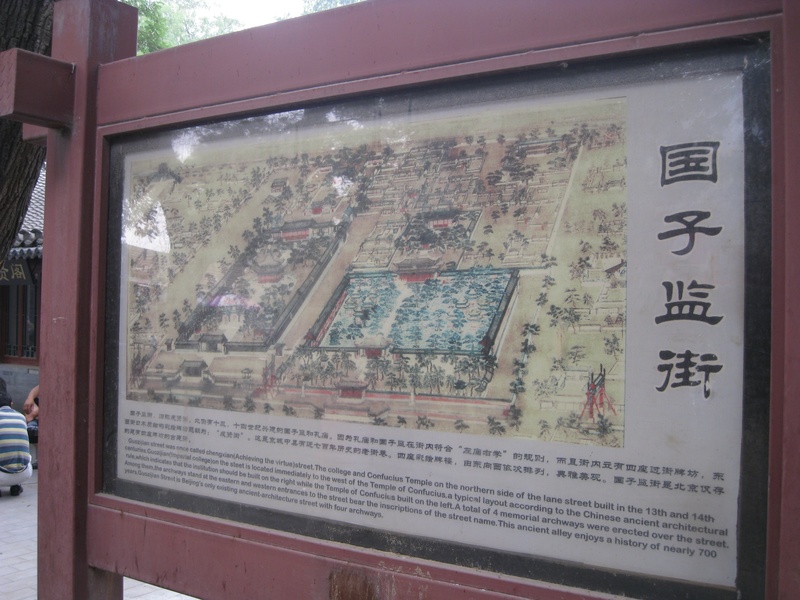 This temple consists of four courtyards and inside the temple you can see 198 stone tablets positioned on either side of the front courtyard. 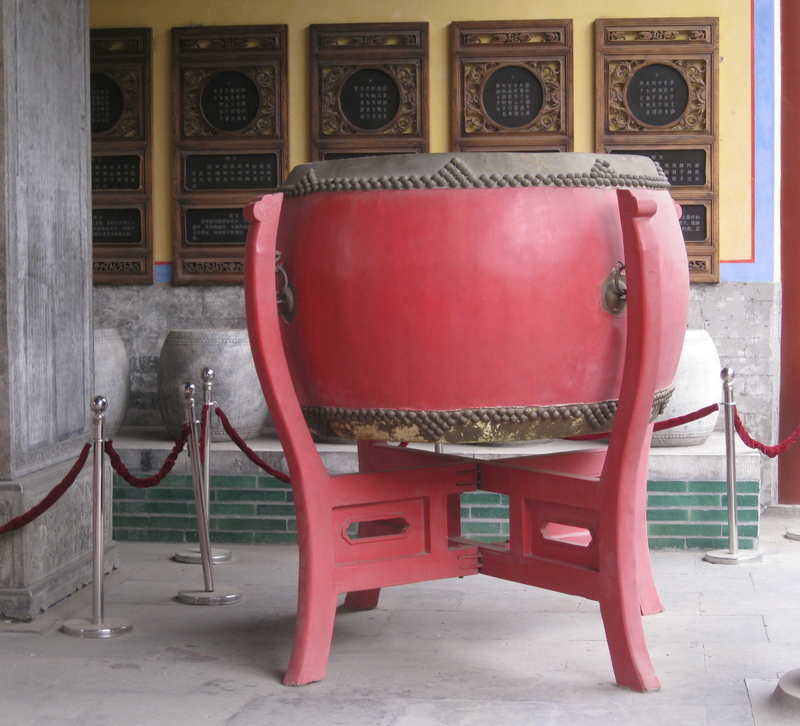 These stone tablets contain 51,624 names of advanced scholars of the Yuan, Ming and Qing dynasties. 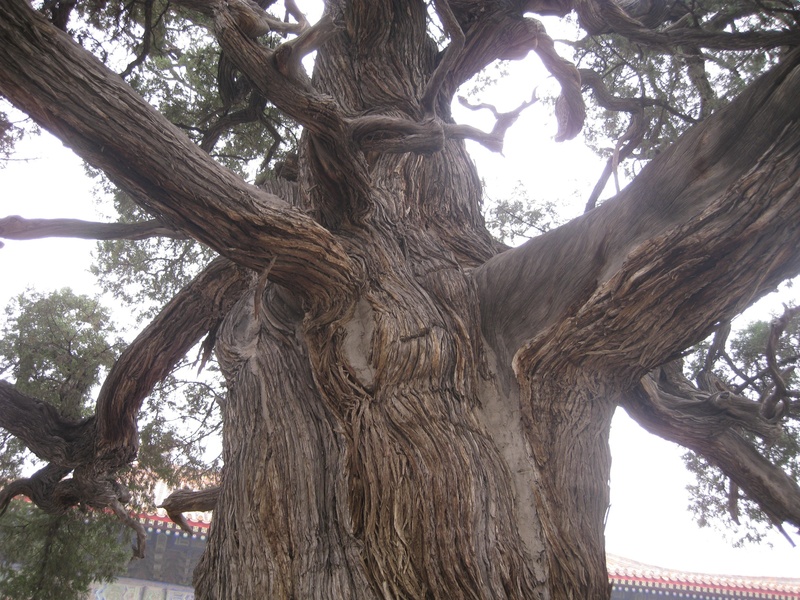 There is also a 700-year-old Chujian Bai (Touch Evil Cypress). 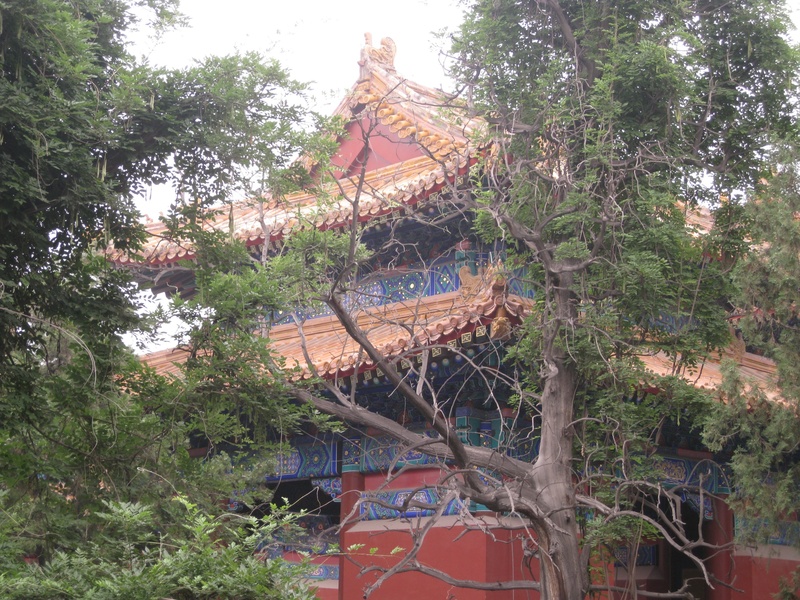 There is a legend associated with the tree; during the Ming Dynasty, a superior official came to worship on behalf of the emperor. When he was passing by the cypress, one of the branches of the tree took his hat off. 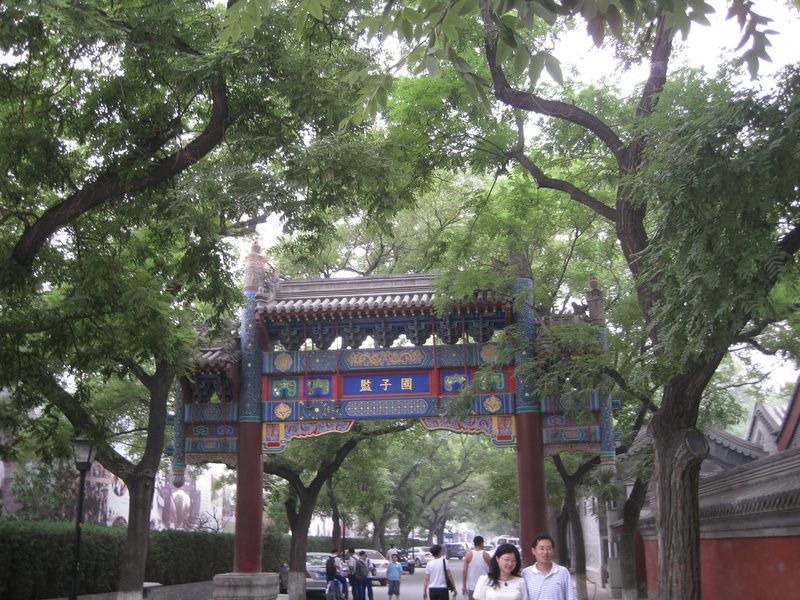 Since this official was treacherous, people have thought the old tree could distinguish between good and evil. Hence its name. 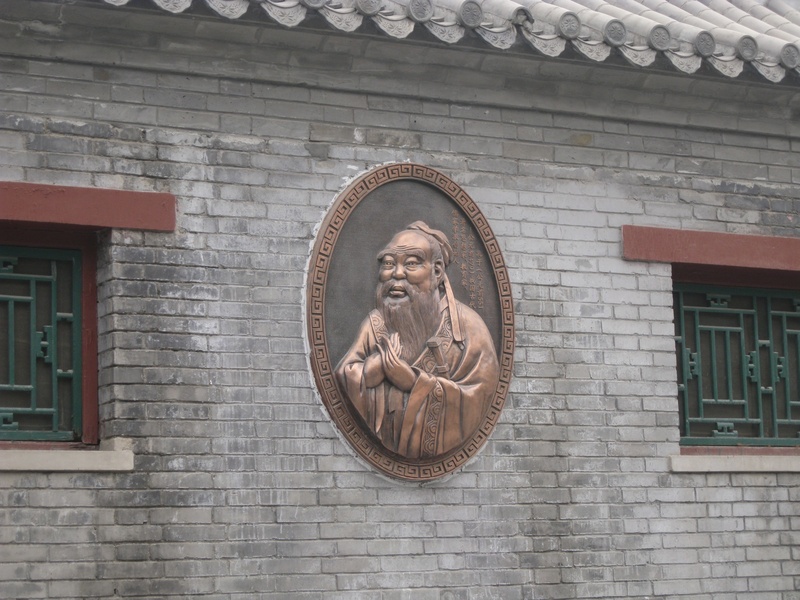 Next to the Confucius Temple, but within the same grounds, is the Imperial College, which was the institute of the highest education where the emperor, annually, espoused the Confucian classics to an audience of thousands of kneeling students, professors and court officials. 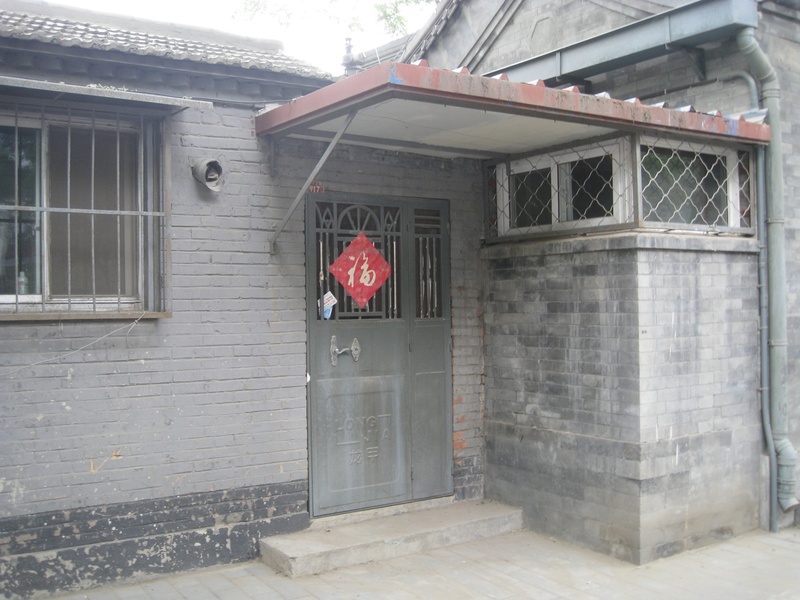 On the site there is also a beautiful glazed, three-gate decorative archway. 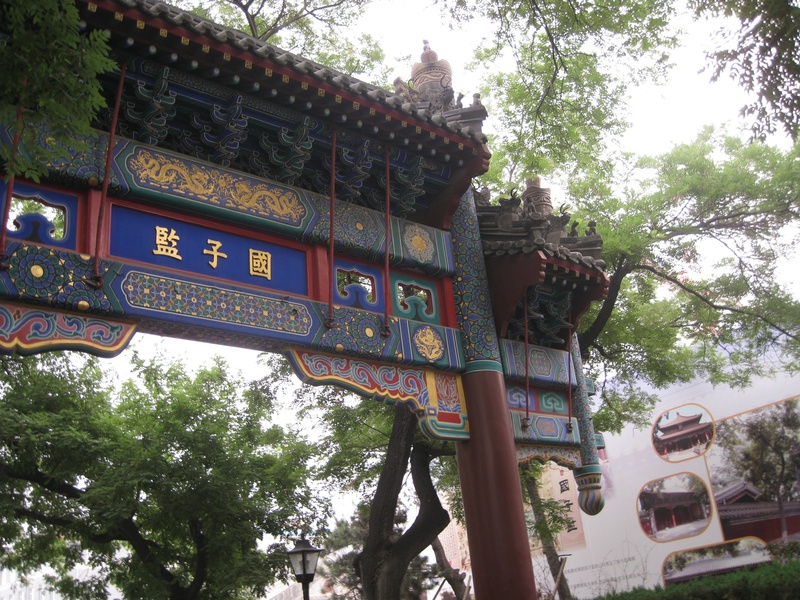 This archway is said to be the only memorial archway built for education in China. 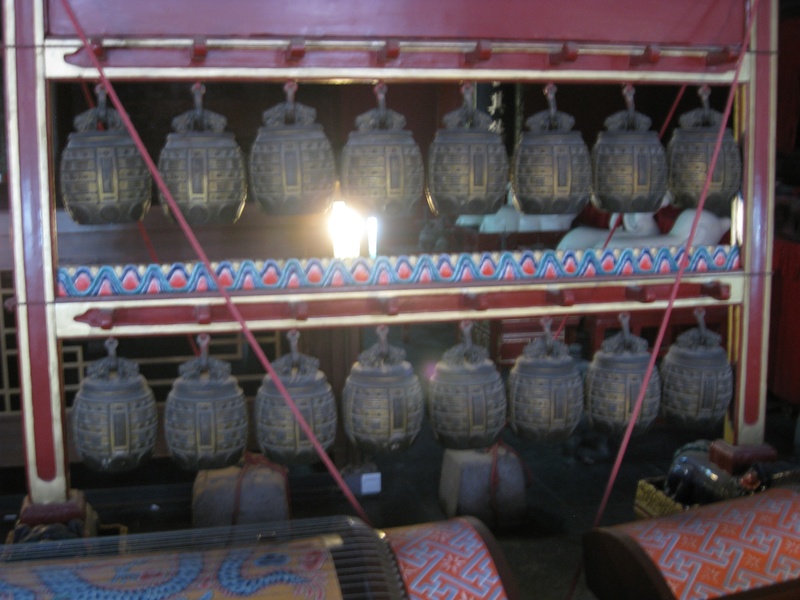 It didn’t take long to walk through the grounds, but inside the temple and institute there was plenty to see including a room for Chinese musical instruments.